The Cloud Customer Connect team is constantly working to enhance our members’ community experience, and we’ve just rolled out a new feature we’re excited to share. Now, our Discussion Forums are easier than ever to access and search via the Discussion Forums Overview pages. From the Forums menu, you can now find Overview pages that summarize the activity of closely related Discussion Forums. These Overview pages have easy-to-navigate sections: Forums; Recent Announcements; New Discussions; and Recently Answered Discussions. From there, just click to browse forums, participate in new discussions or find answers! Our new Find Content feature in the Overview pages makes it easier than ever to quickly search for content that interests you – without having to search individual forums. From any Overview page, just enter your search criteria into the Find Content box. This new search feature immediately returns results from all forums listed under that group of Discussion Forums – giving you instant access to valuable answers, ideas, and discussion topics. Find Content ensures you save time searching, and helps you find the right information, at the right time, in the right place! 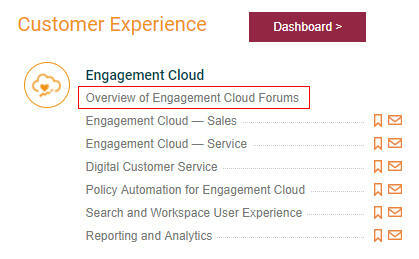 EPM and HCM customers: There is currently no Overview page for EPM and HCM but you can still search across forums using the search box on the top right side of the HCM/EPM Forums menu.